The road across the Passo dello Spluga is very old. Like the road across the Passo dello Stelvio, it was built in the early nineteenth century by the Austrians (completed in 1822). Among cyclists the southern ascent to the Passo dello Spluga is less known than the Passo dello Stelvio but the Passo dello Spluga also belongs to the top climbs of Europe. This is so because of the large number of elevation meters (1822, compared to 1849 for the Passo dello Stelvio), because of the splendid section between Campodolcino and Pianazzo (after 15-16 km cycling), in which the road winds itself up against a steep mountain face with tunnels and a rapid succession of ten extremely sharp hairpin turns, and because the tour is varied. In Chiavenna, where the ride begins, the vegetation is almost Mediterranean; the last kilometers of the climb are made above the tree line. Also the gradient of the road changes constantly during the 30 kilometer long ride. 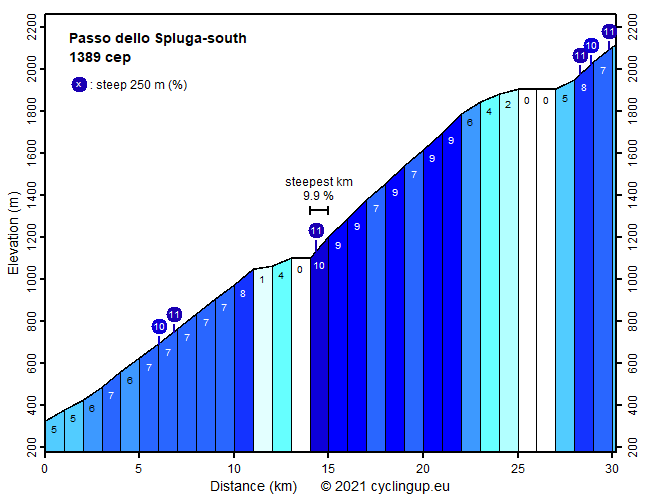 The steepest section is the spectacular passage between Campodolcino and Pianazzo (9-10%) mentioned above. A total of 12 kilometers have a slope of 8% or more. In Campodolcino there are two short descents (together 24 meters elevation loss) and along the Lago di Montespluga, a lake just before the pass, the road runs horizontally for a distance of three kilometers.